Canon Europe is proud to announce the next edition of its third generation imageRUNNER ADVANCE platform with new version 3.8 firmware. This extensive portfolio of 26 products and 7 series, offers cutting edge security and an intuitive interface across all devices. Developed with Canon’s entire Multi-Function Printers (MFP) range in mind, the 3rd edition of the third generation platform provides upgrades across every device in the award-winning imageRUNNER ADVANCE series. To further support its customers, Canon’s BLI award-winning cloud-based solution uniFLOW Online is being updated alongside the latest portfolio. Businesses will benefit from increased synergy between hardware and software to streamline internal processes. 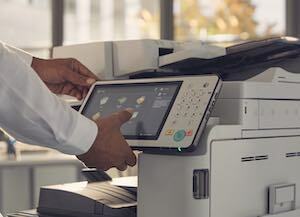 uniFLOW Online 2019.1 offers additional functionality such as Print from Cloud and compatibility with a range of service providers including Box, Dropbox, Evernote®, Google Drive™, Microsoft OneDrive®, and Microsoft SharePoint® Online.